You don’t have to sell your soul to be rich. Nor do you have to sacrifice your relationships in order to build wealth. You don’t even have to scrimp and save! Sure, you can get wealthy that way – but it’s no fun! Fabulously wealthy people have a much better strategy for having it all: money, harmonious relationships, the right connections, the right opportunities, and more. It’s not so much that they do things differently; it’s that they have a different psychology. This is breakthrough information that’s tested and measured – a system that can be applied by anyone. 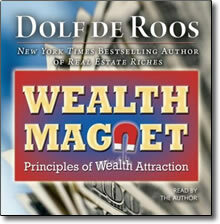 For instance, when Dolf de Roos, a successful real estate investor and author of the Wealth Magnet began teaching his real estate students the foundational beliefs that all rich people share, his student’s success rate went from 5 percent to over 80 percent! The critical difference between an abundance mentality and a scarcity mentality – and how to develop and apply an abundance mentality right away. Why scrimping and saving is a “defensive” strategy to grow wealth – and why it’s much better to expand your opportunities and create wealth in abundance. How your new-found “millionaire mindset” will make every aspect of your life richer – you’ll discover more opportunities to create value, to make contributions to others, and to express gratitude for the abundance you already have in your life. The difference between good and bad debt – and how to use debt to your advantage, rather than being a victim of it. Dolf will cover everything – from what rich people think about work/life balance…economic conditions and world events…lifestyle…running a business…career success… parenting and more…so you know how to handle every life situation like a fabulously wealthy person! And in so doing, you’ll soon find yourself attracting more money, more opportunities, and more time for your family than you ever dreamed was possible. And it’s truly as simple as adopting the psychology of the mega-rich!